It’s easy to be enchanted in Santorini. Walking among the pastel-hued houses of Oia at the end of a day, I find myself completely charmed by the small village, with its windmills overlooking the Aegean Sea. With golden hour sunlight falling gently over the village, Oia was particularly lovely. February 2017, single image, additional exposures for highlights, focal length 78mm, aperture f/11, shutter speed 30 seconds, ISO 64, tripod. With so much serenity and beauty, it’s easy to forget that Santorini’s history is steeped in destruction. Though largely forgotten by the rest of the world today, Santorini was once the site of perhaps the most cataclysmic volcanic eruption in history. Almost five thousand years ago, the volcano — known as Thera — blasted perhaps 14 cubic miles of magma twenty-five miles into the atmosphere. Even the eruption of Krakatoa did not visit that kind of ruin on humans. On the nearby island of Crete was the ancient civilization of the Minoans, Europe’s oldest civilization, and for its time, remarkably advanced. The Minoans were the first Europeans to use a written language and the first to have paved roads. They were a sophisticated people, with a seafaring empire that put brought them in contact with much of the Mediterranean. At the peak of their power, however, the Minoans disappeared. Their disappearance was sudden and mysterious, and vexed historians and archaeologists for centuries. Only recently have archaeologists determined that the two events — the eruption of Thera and the sudden disappearance of the Minoans — are likely related. The eruption of Thera was so powerful that it caused tsunamis, sending massive, scalding waves and debris onshore at Crete, which is only a few dozen miles away. One can only imagine the horror experienced by the Minoans in the wake of the eruption. The suffering wouldn’t have ended once the eruption stopped; famine, plague, and the end of their seafaring economy would certainly have followed. In subsequent years, the Minoans, still weakened from the aftermath of the Thera eruption, were more vulnerable than they would have otherwise been and when invaded by the mainland Greeks, the once vibrant civilization collapsed. The devastation caused by Thera and the demise of Minoan civilization may have left a lasting imprint on Greek mythology. When Plato wrote about the lost civilization of Atlantis, an advanced, peaceful society lost beneath the sea, he was perhaps describing the destruction of Crete. There are enough common elements in the actual story of Thera’s eruption and the myth of Atlantis that scientists believe the two may actually be one and the same. 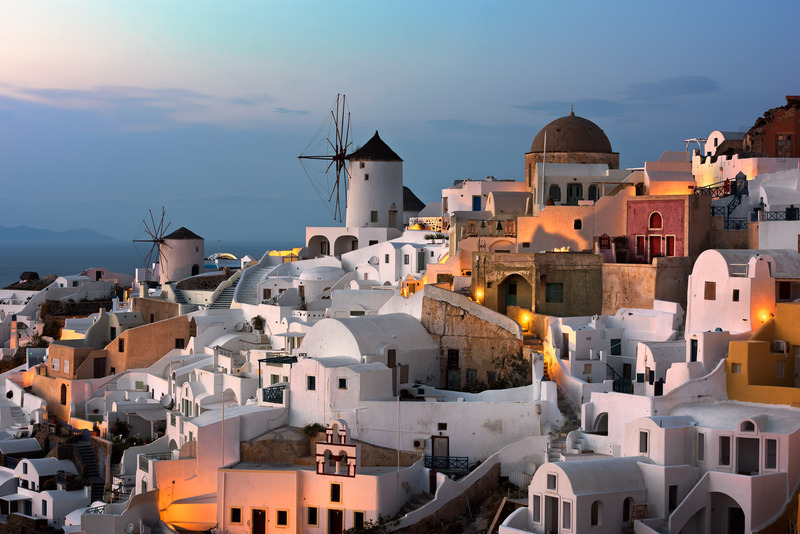 As the sun fades over Oia and its windmills, I try to imagine such an event. But in the early evening sunlight in Santorini, the tragedy is too distant and the present is sublime. I think instead of the blue of the Aegean and watch evening begin to settle in over the island.